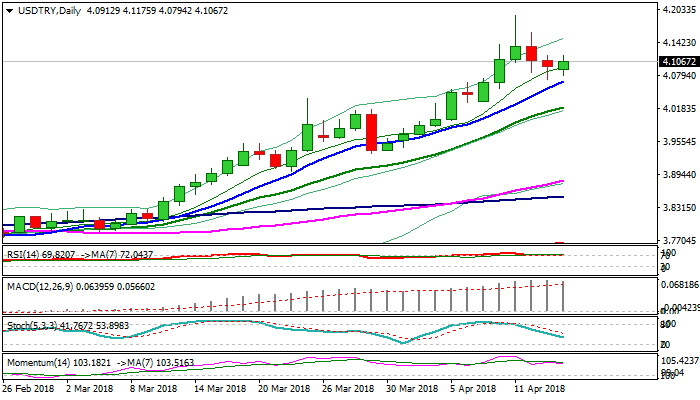 The pair started to gain traction on Monday and bounced to 4.1175 after pullback from new record high at 4.1932 (11 Apr) found footstep at 4.0720, just above rising 10SMA, which currently lies at 4.0693. Overall bullish structure is weighed by overbought weekly techs, but recent pullback looks like shallow correction and positioning ahead of fresh upside. Lira remains under strong pressure from two-digit inflation and rising unemployment (today’s report showed unemployment rose to 10.8% in Jan vs 10.4% previous month). All eyes on CBRT policy meeting on Apr 25, as central bank’s further hesitation to increase interest rates or follows President Erdogan’s suggestions to lower rates in order to boost the economy could put lira under fresh pressure. Last week’s acceleration approached psychological 4.20 barrier and keeps in focus next target at 4.2474 (Fibo 200% projection of the upleg from 3.7153). Rising 10SMA is expected to ideally keep the downside protected, however, stronger movements on lower liquidity are not ruled out and could result in deeper pullback. Ascending 20 SMA marks next solid support at 4.0200, guarding psychological 4.00 support.